ChildAges 4-12 years. Children 3 and under are Free. Feel the excitement and learn the history of Florida's most remarkable treasure--the Everglades. As one of the rare subtropical ecosystems, the Everglades holds spectacular mysteries. Renew your spirit as you glide across miles of river at speeds up to 35 mph, and get up close to native wildlife, many of whom are endangered in this fragile environment. Come visit Sawgrass Recreation Park. 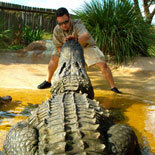 This professional, clean, family-owned South Florida attraction offers nothing but the best in customer satisfaction. A recent half-million dollar renovation now offers more powerful airboats and a wider variety of animal exhibits. 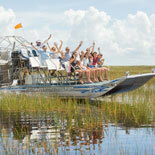 Start your adventure with a 30 minute airboat tour of the Florida Everglades. Your tour will be guided by an experienced captain who has received extensive training. During the tour, you'll listen to tales of how the Seminole Indians and panthers once coexisted in this lush wilderness. Also, you'll catch a glimpse of endangered wildlife as you skim across the glassy water. On this tour, you will feel your spirit soar as you view nature at its finest.
. Take a walk on the wild side back in time with an original dinosaur, the Florida Alligator. 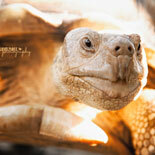 The reptile exhibit features dozens of species both native and exotic to Florida. Along with the friendly turtles and iguanas, you can learn about Cannibal, the 1000 pound alligator! The handlers are happy to demonstrate how these animals live and survive in the wild. Be sure to bring your camera, so you can capture the excitement of you cradling one of these majestic animals with our "Hold a Baby Alligator" experience. Your adventure will include a visit to our Exotic Wildlife exhibit. Predators Unlimited is a separate organization that brings a variety of animals to the park each day to visit. 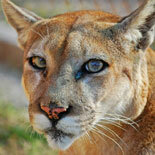 They strive to educate and enlighten the public about endangered species like the Florida Panther. Playful critters abound and amaze as you get up close with many different animals that often include panthers, tigers, and even birds of prey. The handlers are passionate about the care of these gentle animals and are happy to answer any questions. While you are at Sawgrass please don't miss "Swamp"yard Island! You and your family can interact and feed many of the animals at this exhibit. Featuring parrots, quakers, ducks, chickens, and pot-bellied pigs! 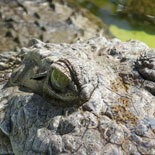 Get your eTickets today for the 30 Minute Airboat Eco Tour and Animal Exhibit. This once in a lifetime adventure will definitely create lasting memories! The Store opens each weekday morning at 7:30 am, and at 7:00 am on Sat and Sun. The first airboat tour of the day leaves just after 9:00 am. The tours operate every 30 minutes until 3:30 pm. The boat offers tours to the animal exhibits between 4:00pm and 4:45pm. The final airboat back leaves at 5:00 pm. The park is closed for Thanksgiving and Christmas and may have limited hours on Christmas Eve and New Years Eve. Please call Customer Service (the number will be on your eTicket) to confirm operating hours before your visit. Exchange your eTickets at the White Store in Sawgrass Recreation Park located at 1006 N. U.S. Highway 27, Weston, FL 33327. Age 4-12 years. Children 3 and under are Free. No reservations required. 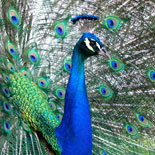 The variety of animals on display may change from day to day and there is no guarantee of specific animals at any time. It is recommended that you show up no later than 4:00 pm, so that you may visit the animal exhibits first (the animal exhibits close at 5:00 pm) and then take the final airboat tour of the day. Please note that the hours of operation are subject to change based on season or inclement weather. Please call Customer Service (the number will be on your eTicket) to confirm operating hours.